Want the secrets for a calm, sleeping baby? In March, Mommy Hands Baby Sign Language will begin offering workshops to teach parents tips for having content newborns and happy, signing babies. Earlier this year, Mommy Hands Baby Sign Language Owner Roz Jutras (aka The Signing Mom) became a certified instructor of "The Happiest Baby on the Block." This internationally renowned program was developed by pediatrician Dr. Harvey Karp, who has unlocked secrets for soothing colic and boosting infant sleep. By understanding Dr. Karp's "Missing 4th Trimester," "Calming Reflex," and "Cuddle Cure," you will have all the tools you need to soothe an infant's senses. I was given The Happiest Baby on the Block book and DVD as a shower gift when I was expecting my baby. I was amazed at the common sense and effectiveness of the tactics outlined in the program. Yes, my baby still cried, but I was able to soothe him quickly. Risking the fact that you may begin to hate me just a little now, I still must admit . . . my little boy started sleeping for 10 hours a night when he was 10 weeks old! 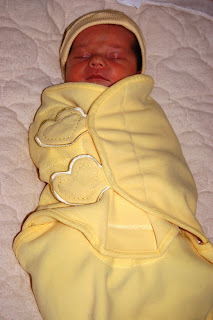 It was Dr. Karp's "Cuddle Cure" recipe that led us to try a velcro swaddling blanket and find a vibrating bassinet on Kijiji.ca. It worked amazingly well for our son and our sanity. During the three-hour workshop, Roz will spend two hours introducing "The Happiest Baby on the Block" program. The final hour will be an introduction to baby sign language, which helps parents and pre-verbal babies reduce frustration through communication. The workshop is designed for expecting parents and parents with newborn babies up to four months. The $80 family registration fee includes the workshop and The Happiest Baby on the Block DVD and guide. Click here for session dates and to register. Mommy Hands Baby Sign Language is giving away The Happiest Baby on the Block book and a free workshop to one lucky saskmom.com follower! You can enter this draw twice. One way to enter is to share something that makes you happy as a parent, or an expecting parent, in the comments section below. Earn a second entry by becoming a fan of Mommy Hands Baby Sign Language on Facebook and adding that as a separate entry below. This give-away will close on Feb. 19, 2010, at noon. At that time, a winning entry will be selected through Random.org. This give-away is open to Saskatoon-area residents only. Click here to enter.